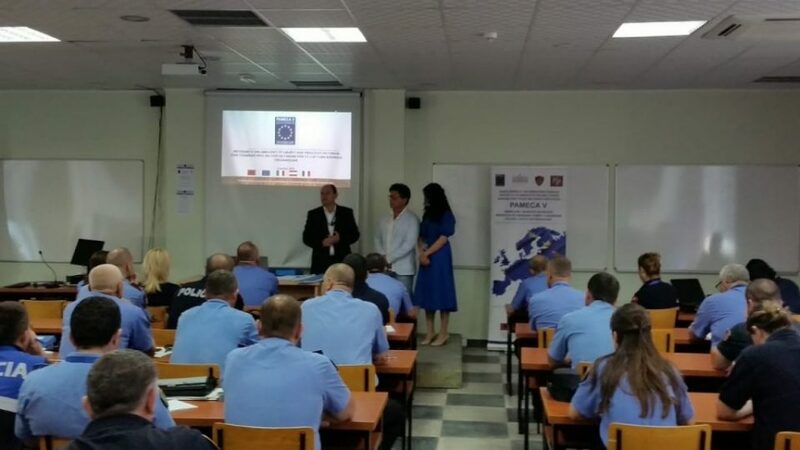 On 6 June 2018, PAMECA V organized a training which was attended by eighty students of the Faculty of Security and Investigation, Security Academy. The aim of this activity was to further strengthen the capacities of Albanian State Police regarding proactive investigation techniques, as determined by sub-activity 1.4.2 “Assist Albanian State Police and Prosecutor Offices with the best experiences in conducting proactive investigations”. This three-hour activity was facilitated by Mr Mirarchi, expert in organized crime, and topics discussed were as such: specific law enforcement structures for fighting and preventing organized crime, methods of organizing the investigation group and process, and some concrete prosecuted cases and the employed investigation techniques to solving them. This was the same training program that was delivered to the first half of the students of this Faculty on May 16th.